← The cold is coming. Live capability all over the place. Basset calls this blast from the (snowy) past “Pinto in the Snow,” but I don’t think it is. Looks more like a Ford Country Squire without the wood trim, which would then make it a Country Sedan (I think). My friend Paul had one — aka the Party Wagon — and I’d recognize it anywhere. But the model isn’t the point of this picture, of course. This is weather journalism, dammit! Basset writes: “right in the middle of a state highway somewhere up north… right after the giant snowblower went through.” Northern Michigan, of course. Where else would people drive Ford station wagons in weather like this? * The headline of this post is an inside joke. Ha ha ha. Nope, Nance, that is indeed a Pinto. Look closely and you’ll see it’s a 2-door wagon. Definitely a Pinto, I drove it there. would have been 1978 or 79… the larger-market stations downstate in Detroit and Grand Rapids were starting to shoot video and do live shots but we were still entirely on film. You’re right. It’s a Pinto. Maybe my brain has recalibrated, but it just looks so big. I drove what had to be the rustiest Pinto wagon on earth back and forth to the UP regularly in the late 70s. Snow and ice storms galore, no extra weight in the back. I did not recognize this as a Pinto either but I’ll take your word for it. I figure I have just blocked all memories of ever owning such a vehicle. Lou Forrest would be very pleased. And so would Dave Layman’s 3-piece suits. Snow in Atlanta, by the way. WT…? well, I was 22, immortal, invincible, and infallible when I moved up there, so driving in the snow was no problem… actually my VW Beetle did a lot better, but the Pinto had a heater. now, a modern Dodge Charger is a whole ‘nother story in the snow. rented one of those at the Grand Rapids airport when we went back over Christmas and didn’t even get out to the highway before we took it back and swapped for a 4-wheel drive SUV. so once we had traction and a reasonable chance of forward motion we had one of those white-out experiences going up 131. nowhere to stop and someone probably would have hit us anyway, we just wandered to one side of the interstate till we hit the rumble strips, then back to the other. Ouch. Very painful picture. Since I began living in my current house that was built during the dark days of disco, I’ve recognized that if it were a car it would be a 1979 Ford Pinto station wagon. Seems like it would have more room than the regular Pinto, but no. Not much. Even if it’s gutted, painted, supplied with a new engine, new seats and new carpet, a custom dash painstakingly made of solid oak by an Amish carpenter, etc, it’s still a 1979 Ford Pinto station wagon. At least the car in the picture is white and not brown. I didn’t even know Pintos were available as station wagons. I had a friend who had a Pinto, and I remember it wasn’t considered a cool car. So when I could afford a car, I did her one better and bought a Gremlin. My brother-in-law the mechanical engineer said it was like driving a rock but my contrary nature loved it. And surprisingly, it was fine in the snow. Oh, my god. “Like driving a rock” has to be the funniest thing I’ve heard all week. Thanks, Sue’s brother-in-law. My grandparents used to call the Gremlin a “pregnant roller skate.” Didn’t make sense then, either, but everyone thought they were hilarious. For all the mockery, deserved, of weather related local news remotes, the exception that proves the rule is when you get close to Minus 40 Fahrenhite, and send a guy outside with a cup of hot water — go live just in time for a minimum of explanation, and then fling the cup full up in a fan in the air. You hear a report like a gunshot (well, a .22 anyhow), and then a thud as the now frozen water hits the ground, solid. Worth going back for a second time, after sports right before flipping to the Seinfeld rerun. Damn, that’s seriously irresponsible Jeff. I admit it helps to be loaded when gravity fails and negativity won’t pull you through. Pot’s better than brewskis, though. It’s all in slo-mo and it seems like you’re on the side of the angels. I’m doomed or blessed (“it’s a blessing and a curse, you’ll thank me later”, A. Monk), to never take inclement weather news (both weather and news) with more than a moue. 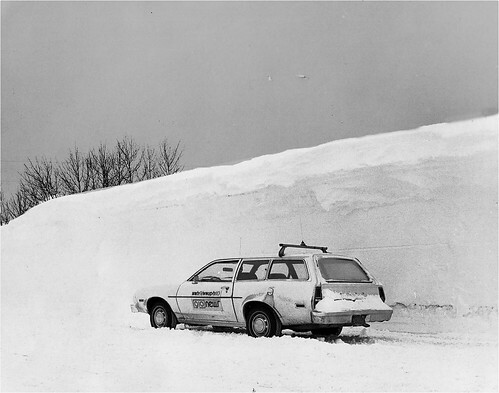 We lived in a Boston satellite town (there are no suburbs) through the blizzard of ’78. I was managing a solid waste transfer station (garbage truck dump on the way to the landfill). We served most of metropolitan Boston, and we couldn’t close until the last of the 40 yd. trucks dumped their loads. You can’t leave a compacted load of garbage on a truck. Methane forms, spontaneous combustion is inevitable, the first thing that burns is the hydraulic lines, and a $125k truck is toast. So I watched the snow mount, for hours. We had a Triumph Spitfire, wonderful roadster, but it cleared clear ground by about 8 in. By the time I got out of there, accumulation was around 24 in. It took me three hours to get home, maybe 3.5 miles from work. When I got home, I poured a large Lynchburg elixir, and after one sip, the phone rang. My brother Mark was calling from somewhere he could “see the Citgo sign”. I had thought he was safe in Georgia. I went out to find him. Mark had a very large Chrysler. We learned to drive doing donuts after dates in the Motor City, both of us could handle the weather. I got him safely back to our apartment in Watertown. Then we thought about the ramifications of the storm and realized a heroic effort was necessary. We went back out, but this time in the Chrysler tank, with a toboggan. We bought several cases of Molson’s Golden (and it’s OK, but I sure wish they had Sam back in the day.) We bought several cases of DeKuper cherry brandy half-pints. We loaded what we could in the trunk of the beast and the rest lashed to the toboggan. Got home safely, unloaded our cache, and put on Back in ’72. Around 6am, I was wide awake and realized we had neglected food. Wind was 45-50 mph, but I put on wondrous new Thinsulate boots and about half the clothing I owned and headed out. Chest high drifts in open spaces, but somehow reached a local mom and pop. I despise ski-mobiles, but I was ecstatic to see one parked in front of whatever the Italian version of a bodega is, with vapor clouds coming from the boiler stack. So I bought about 15 lbs. of cappacola, mortadella and Old-World hard salami, and all the provolone in sight. And all the day old bread. Slogged it home in a big trash bag, in the pillion seat of a Ski-Doo. When I got home, the storm had cleared, there were 48 in. of snow, and people had awakened and ventured out. I was personally iced in. I mean, my face, my beard, my clothes. We fed and watered the community. After a day or two, the landscape was pristine, gorgeous, and the sun broke through. Our street was a glacier about three feet thick, until emergency workers showed up with heavy equioment. The first few assaultsn the icepak by backhoe were hilarious. The Caterpillars bounced off. Much-maligned Michael Dukakis managed this pretty well, even if his ubiquitous TV presence in the infuriating crew-neck sweaters infuriated everyone. (Probably deserved a Presidential Medal of Freedom for a ‘good job’.) Nonetheless, cabin fever set in, despite the alcohol and the great sandwiches. On the fourth day, the sun began to melt our icy bars. We went out en masse, everybody on foot, and laid waste to the frozen bread dough section at the supermarket. It was like 28 Days Later without the zombies. So I say: Lake Effect? Try the Atlantic. Cruel mistress. If Gordon Lightfoot thinks there’s something about the Lake that comes close to the wave that cleared the lighthouse in Boston’s inner harbour, his idea of a real storm is pretty wimpy. And I grew up with ice-storms in Detroit. Yep, Michigan’s colder than New England in Winter. But the pure whim and inchoate violent urge of North Atlantic weather make those Detroit ice storms seem trivial. Cold is something with which modern man can deal. Being buried in precipitation isn’t, especially when the wind conspires. Maybe Michigan is headed for turning arctic. Maybe not. I sure don’t know. I’m not a scientist. Anybody stupid enough to claim human behavior has no effect on global climate is either a sophist ahole, or a wackjob, or both. Claiming these things have happened before is the saddest refuge of ideocrats, and, logically, makes the opposition case. Why now? When it happened before, did Manhattan rule the world below the new sea level? And I don’t mean to interject something as mundane as football, but refs stepped in to make these games today ridiculous, and they made things a Pats game and they’re doing their best to screw up the other. It doesn’t matter the sport. Refs are aholes that wished they could but couldn’t play. They screw everything up. On crucial calls, they’re wrong more than they’re right, and they do it on purpose. They’re jealous. I’d love to blame today’s loss on the refs, but the Chargers lost it all on their own. Four field goals. Geesh. This is why I tell everyone, me and the Chargers are dating, we just ain’t goin’ steady anymore. In fact, we’re breaking up for the summer. Well, Danny, condolences. Chargers had the misfortune of relying on Philip Rivers, the one QB that’s a more insufferable, self-important prick than Tom Brady. Didn’t have to be that way. Drew Brees would have won that game. Of course, had Ladainian Thompson played, quarterback position would have been rendered moot. And you’re right, it’s not really the game officials. Belichek lobbied the league to change the holding rules all last offseason. And he had a plan. Pats were called exactly 11 times on the entire season. Now, there’s almost no such thing as offensive holding against a Pats lineman. Rooting for Eli ought to be the new national pastime. As he sinks he rises. I don’t necessarily think NYC is the belly of the beast, but it spawned Rudy 911, and without Brooklyn, it’s got no soul. If you root for the Pats, it’s like rooting for W. You deny the Constitution and the laws of physics when it suits your greedy needs. People in New England wouldn’t like the comparison, but the Pats are the epitome of the Wadministration. You change the rules in your favor and tell everybody else to including Congress to f**k off if they object. And then you eavesdrop. I guess I’m the only one of the nn.c regulars who drove a Pontiac Astre. Yes indeedy – bought it on my 19th birthday. It was a good little car, and I even gave it to my younger brother after driving it for 8 years, and it lasted him another 18 months. I loved the “like driving a rock” comment. Made me think of a phrase my hubby attributed to some really cheap bed pillows we had long ago: Soft Rocks. Football: I have offered condolences to the many many many many Packer fans here, but secretly I am so glad that we will not have nonstop Packer coverage (including things like pre-empting evening coverage to run old games) for the next two weeks. It’s enough to make you want to kill yourself. Although I admit I loved seeing the Packer Bikini Babes in the stands – the sooner the country loses the idea of Wisconsin women as beer-guzzling heifers the better. It smacks of someone hiring three models, but still, they are as gorgeous and full of life as my daughter and all her friends and a good example of what Wisconsin really has to offer. A Pontiac Astre! My goodness, Dorothy. They made like three of them. I’m amazed this thing lasted 10 years. The Astre was the Poncho version of the Chevy Vega, a car with a distressing Fiat like tendency to melt when exposed to moisture. Yep, it was dark green and I nicknamed it “Gracie.” Because my mother used to say Mike and I reminded her of George Burns & Gracie Allen. ADDED: Holy Crap, I just did a Google search for a picture of one and found out Jay Leno has one (1976) in his collection. i thot it was the pacer that was the pregger skate. my pal betsy got one for graduation, and we took it out drinking the night before on High Street. it was some kind of weird office park fountain green. what was up with those AMC colors? my grandparents somehow wound up with a Hornet a few years earlier; i remember dropping them off at the doctor’s office and taking that baby out across the roads of Carroll County, trying to get it above 65mph. the noise! I had an AMC Matador in grad school. Nuff said. alex • basset • Jeff • nancy • kayak woman • jcburns • basset • brian stouder • Mindy • sue • Kim • basset • Jeff • basset • michaelj • michaelj • Danny • michaelj • Dorothy • Sue • MichaelG • Dorothy • joodyb • Connie • and YOU.